Airports Authority of India (AAI) was constituted by an Act of Parliament and came into being on 1st April 1995 by merging erstwhile National Airports Authority and International Airports Authority of India. The merger brought into existence a single Organization entrusted with the responsibility of creating, upgrading, maintaining and managing civil aviation infrastructure both on the ground and air space in the country. 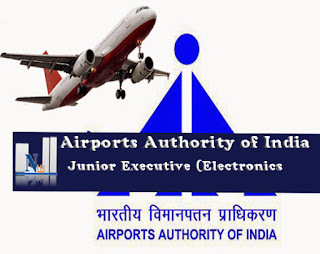 AAI manages 125 airports, which include 18 International Airport, 07 Customs Airport, Domestic Airports and 26 Civil Enclaves at Defense airfields. Qualification : candidates possessing valid GATE 2014 OR GATE 2015 marks and having full time regular Bachelor’s degree in Engineering/Technology (B.E./B.Tech) in the disciplines of Electronics/ Telecommunications/ Electrical with specialization in Electronics with minimum 60% marks are eligible to apply for Junior Executive (Electronics). 1. 8th of September, 2015 is the starting date for submitting online application. 2. 9th of October, 2015 is the ending date for submitting online application.